We are engaged in producing and supplying a fine quality Belt Conveyor. Our product is used in mixing process for various materials. Due to its versatility and affordable rates, our product is recommended widely in the market these days. These products are fabricated using optimum grade raw material that is procured from reliable vendors of the market. The products we offer are available in stainless and mild steel, which helps in speedy and uniform mixing of ingredients with the help of ribbon and spiral type blades. 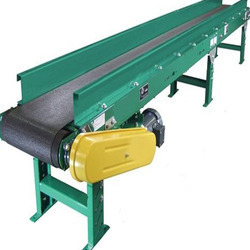 Slate Conveyor is widely used for conveying and stitching bags.It is basically used in the cattle feed industry, poultry feed industry, biomass industry, Sugar mill, and any kind of bag filling industry. We are a prominent organization engaged in manufacturing, a quality range of Chain Conveyors, The sophisticated manufacturing unit with all the necessary machines & tools allows us to fabricate the equipment as per the international standards of quality. We offer our clients a wide collection of Screw Conveyors those are is designed in accordance with industry norms. We manufacture and export using a high-grade raw material to ensure that these match to international quality standards. These products are available at affordable rates and can be customized as per the client's specifications. Our product range is known for their high energy saving, durability, reliability and easy installation and maintenance. We provide our clients with finest and smooth finishing. It ensures long lasting performance and high tensile strength.